Two new library refurbishment projects in Surrey have allowed the library service to introduce new ideas and new ways of working, writes Katie Kinnear. 2012 has seen the opening of two major library refurbishments for Surrey County Council (SCC) - Dorking Library, relocated from a Victorian building on the outskirts of town to three modern shop units within the town centre, and Woking Library, Surrey’s largest and busiest library, which was fully refurbished in partnership with Woking Borough Council and Moyallen, the town centre developers, as part of a major Town regeneration project. 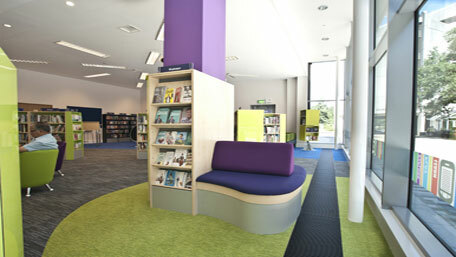 The library design and layout was undertaken by a small SCC library project team in conjunction with FG Library Products, who also carried out the fit-out. Bright accent colours have been used throughout the building to define areas and create a feeling of warmth. Modern bookshop style shelving has been installed in both libraries, and high quality stylish furniture creates an exciting dynamic environment. The layout leads people on a journey of discovery around the library, creating areas where customers can sit and relax, study, chat with friends, use a laptop or simply curl up with a book. Particularly attention has been paid to the Children’s and Teenage libraries where we have designed an interactive and stimulating environment. The illuminated feature walls, bright colours, different types of seating and Reading Hideaways all add to the excitement and will help to foster a love of reading for life. All the furniture within the Children’s Library is moveable so that staff can easily hold Bounce & Rhyme or Story time sessions. With the introduction of a wireless network into libraries we have provided special laptop desks and chairs with tablets, and customers can connect their laptops to the wi-fi network for study or leisure. 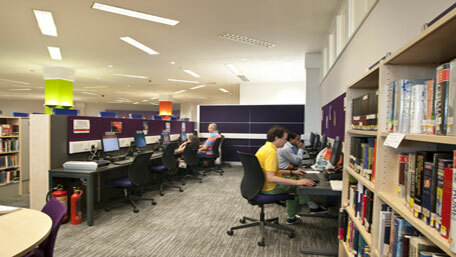 One of the computer areas has been configured for teaching sessions and a meeting room has been created in each library that can be used by local groups. When not in use as a meeting room it can be used as a quiet study area. Moveable furniture and shelving also feature throughout, but carefully designed with concealed wheels. This allows us to hold events for audiences of up to 120 people in Dorking and 170 in Woking. We have taken a holistic approach to both projects, based on our evaluation of previous successful refurbishments. In addition to refurbishing the fabric and layout of the building, we have implemented a new way of working for the staff and are trialling a new approach to the display and guiding of stock. We have taken a reader centred approach to the whole project and there is greater emphasis on helping readers to find what they are looking for and to encourage them to discover interesting and new reads serendipitously. Gone are face-on shelves and in came acrylic equipment from Opening the Book. Feature fillers allow face-on books to appear throughout the bays and create interest among the selection of titles, not just along one shelf. A new role of ‘Library Advocate’ has been created and staff are timetabled specifically to meet and greet users in the front-of-house area, ensuring users get the best out of their visit, maintaining the appearance of books in the quick choice areas and simply helping to ‘sell the service’. All staff are library advocates but the value of the customer experience can often be lost in the day to day jobs involved in running a library. Specifically highlighting and timetabling this role brings the focus back to the customer by making every visit a valuable one. Take a virtual tour and see the new library layout.